You may have noticed that the side mirrors on various Ford models look different from each other. For example, the side mirrors on a Ford Explorer are much smaller than those on an F-150. Why is that? It’s because the designers at Ford engineered the side mirrors on each model to accommodate the driver’s needs. For example, the F-250 is built for towing, while the Focus isn’t. Therefore, the F-250 has bigger side mirrors designed to assist with towing. 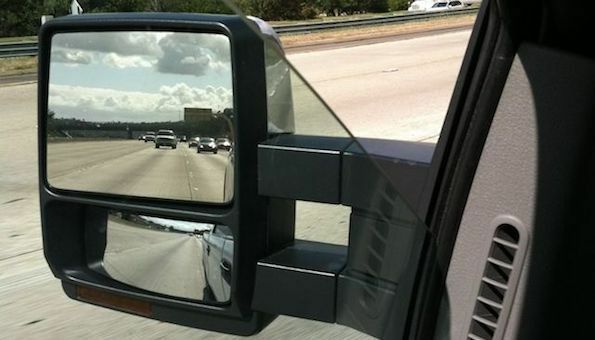 Ford trucks come with convex mirrors in addition to the standard side mirrors. Also called apex mirrors, convex mirrors are designed to help you see the cars surrounding your truck because trucks have large blind spots. Ford cars don’t need convex mirrors because they have smaller blind spots. Trucks are longer, therefore the side mirrors need to be placed farther away from the vehicle for the driver to be able to see well. Increased visibility is incredibly important while towing. Longer arms allow the driver to see what is beside their trailer better while on the road. If you’re wondering if you could install a truck side mirror on your car or vice versa, the answer is no, you can’t. It’s because the mirror isn’t going to fit your vehicle. For example, truck mirrors (especially those with dual arms) require more bolts than car mirrors. You can see if there’s a fancier OEM side mirror made for your car. You can do this by searching your Ford model in our catalog. You’ll get a list of all the side mirrors that will fit your car. You might find one that has the features you’re looking for (such as heated mirrors).